For Julian Tysh, a typical workday is spent among masterpieces. An art handler by trade, Tysh shuttles priceless art and artifacts between Sotheby’s auction house in Manhattan and the estates of its one-percenter clients. His colleagues have handled everything from decommissioned space shuttles to a copy of the Magna Carta, and he himself once hung a Warhol print he estimates was worth well north of $20 million. But Tysh hasn’t had a typical workday in a while. 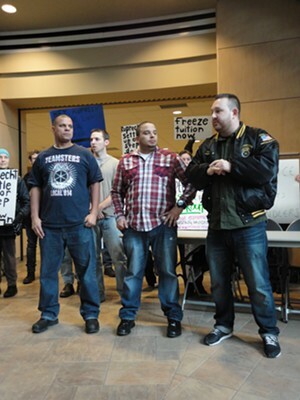 Last July, Sotheby’s locked Tysh and 41 other members of the International Brotherhood of Teamsters Local 814 out of its facilities, fearing a planned strike would disrupt operations at the auction house. The two sides were deadlocked in a dispute over whether to reduce the handlers’ work week and increase the number of temporary, non-union workers. Since then, Tysh has found himself on picket lines, in Zuccotti Park and — on Friday afternoon — at the University of Vermont’s Davis Center. 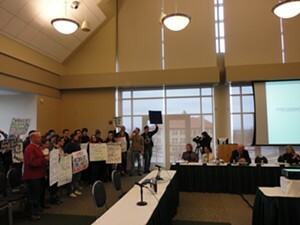 Joined by three fellow art handlers and a ragtag crew of 30 UVM students, faculty members and assorted Occupiers, Tysh spoke out at a press conference demanding the resignation of Sotheby’s CEO William Ruprecht from the university’s board of trustees. Holding signs reading, “Ruprecht: Settle up or step down!! !” and “Corporations are not people,” the assembled 99 percenters inveighed against Ruprecht’s outsized salary, arguing that his bonus alone equaled the entire union contract in question. They said Ruprecht should either resign from the UVM board or come to an agreement with Local 814. The group then marched up to the fourth floor of the Davis Center, where the board — sans Ruprecht — was in the midst of its winter meeting. After an obligatory mic check — MIC CHECK! — the Occupiers chanted away as the trustees looked on sullenly. “UVM’s stated values include,” came the call. “UVM’S STATED VALUES INCLUDE!” came the response. Grim-faced, the suit-clad trustees listened politely to a few rounds of call-and-response before the meeting was called to order and board members called for an executive session. After a few verses of, “Workers’ rights, students rights, same struggle, same fight!” the protesters filed out of the hall. And the occupation was over. 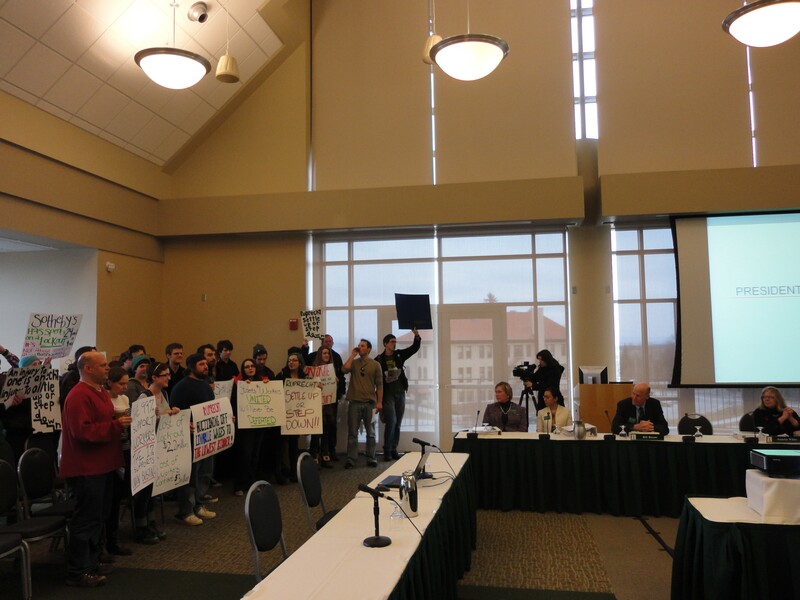 UVM board chairman Robert Cioffi, seemingly unmoved by the protest, released a statement later in the day expressing confidence in his board. “I recognize that there are strongly held views with respect to the labor dispute at Sotheby's, which is in proper channels for resolution with a federal mediator,” he said in the statement. “That matter is in no way related to the functions and responsibilities of the UVM Board of Trustees.